Very interesting. Have been following your blogs for about 5 months when I first joined this group. Look forward to read each one. Have you taken insurance personal and vehicle etc. Into account anywhere. Good luck and keep your blogs coming. Interesting reading. I have just bought ours up to date (we use spending tracker) and our average spend per day has been 65 euros inc all insurances (would be interested to hear what yours is) including those we still pay into as such as life cover etc. Not bad eh although I know for sure by the time we leave the UK that will have gone up considerably. 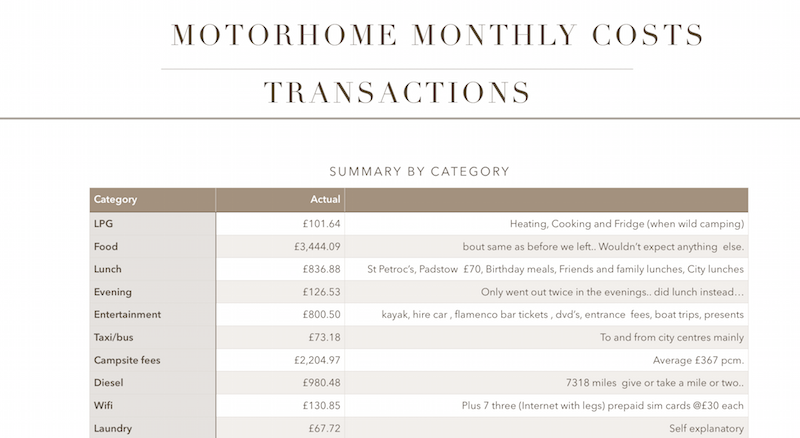 We have already spent more this month than we did in the whole of last month!!! A small price to pay though to catch up with all our friends and family. We have both got seriously itchy feet to get going again!! It’s a very interesting exercise that’s for sure. I don’t think in 28 years of knowing each other have we been so thorough in documenting our spending. And it takes minutes per day. I will add all the other costs..storage etc.. and see whats comes out. Looking forward to a nice glass of something together at some point. We are back for Xmas for 3 weeks, back on the ferry on 4th january to denia in Spain.. hope to catch up soon. 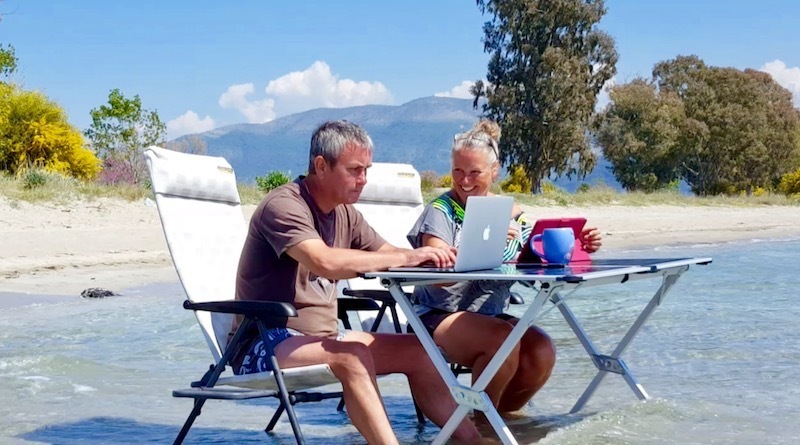 We are just about to head off on our first 6 month tour of France, Andorra, Spain and Portugal and have found your Blog great reading over the past months and your cost breakdown very helpful in budgeting. 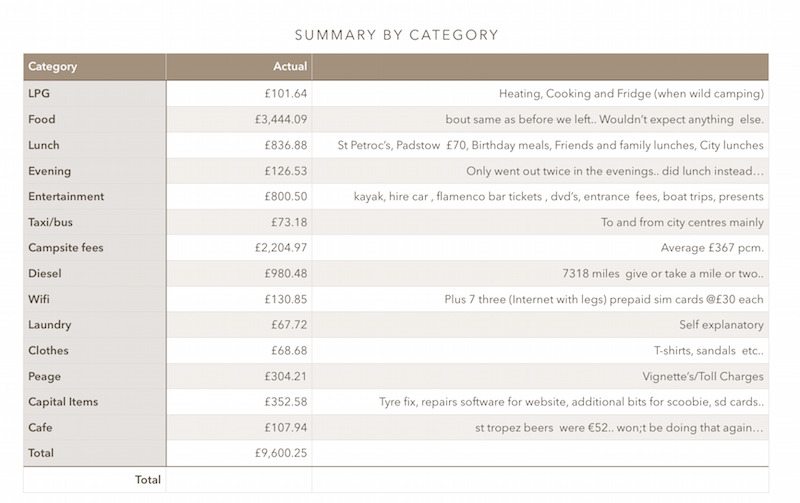 I am curious to know if any of these costs have been offset by any income from your affiliate links. I have just configured my blog to keep family, friends and any strangers updated on our progress and have put quite a few Amazon links on our Blog. We have a separate Amazon Affiliate site http://www.ootdoors.co.uk which ticks along nicely and hopefully will continue to do so when we are on the road with some passive income. Reply to our e mail if you do not want to publish your reply! It’s all a far cry from 1989 when we (me with my then husband) set off for a year travelling around Europe in a thirteen-year-old T2 and a budget of £10 a day for the two of us including fuel etc. Yes, I kept a close eye on every penny and we did the whole year on budget. Of course, there was no internet or mobile phone to consider. Fascinating to see how things have changed – if only I could persuade my present husband to go, even for a few weeks, but he doesn’t want to drive on the wrong side of the road! And it would mean a lot of eating out, campsites with electric hook-ups, etc. Our T6 barely gets off the drive!